Colette Ruff - Congrats mom. Happy Mother’s day! I-wanted-a-sister thing soon and come up with something! Congrats! I guess now you’ll have to buy clothes that aren’t pink, Amanda! I’m glad things are going well and tell Hope it’s better it’s a boy- this way she won’t have to share her Barbies. Meg Grove-Curtiss - Yeah! We need more boys in the world! HA! Lemme see you have Hope …. you can try Chance or Ace. kristy pennino - congrats! we’ll have brainstorm and come up with some cool typographic names sometime! Sharyn - Hi Kern Family! Congrats on thinking blue! Boys are sweet and Hope will think so too. I vote for Jason with a middle name from Mommy’s side of male relatives. John Sousa - Yeah!!! The suspense is over. Wow, a boy. Congrats. Just be careful when you have to change diapers. Boys have better aim Whatever you name him should start with a “J”. J names are the best. Joshua, Jacob, Jordan. Jackson, Jeremiah (I love that name, but Diana said no), James. See, endless possibilities. Ooh! I have lots of clothes that are too small for Josiah, lemme know if you you’re interested in them. Congrats, again. Lora S - Congratulations Amanda! I knew it was going to be a boy! Boys have been coming around lately! How about Noah? Oooh … I bet Jason is ecstatic! Nando - Aaw!! Congratulations, Amanda! I’m so glad for you. This is so cool, he’s going to have an older sister to watch out for him. Again, congrats & I wish you guys the best!! Faye E. - Congratulations! “Big sister” can help educate and entertain!!!! K. Simari - Ha! I knew it! Dont worry about Hope, because my bff had the same issue with her daughter, but later in her pregnancy she was more accepting and couldnt wait to have a baby brother. he is here now and she adores him! I think there is a same age difference my friends daughter is 4 / almost 5. Phyllis - Okay, Kristy- game on. Bernhard? Bernhard Em (as in Modern) Kern. Amanda and Jason, feel free to use any of these names that suit your fancy. ha! Angela Scarlato - Oh my gosh, that’s so cool! Congratulations! Phyllis - You forgot Les Kern. And yes, we are all excited, though Jason actually admits he was hoping for a girl. Now of course he’s very proud be having a little boy too. 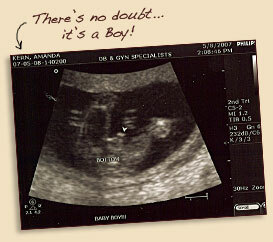 He made sure he got a second opinion from the doctor on the ultrasound to make sure the tech read it right – but as you can see – there’s no doubt at all. Janice Lewis - CONGRATS! You are going to have so much fun! Rick & Barb - I knew it!! CONGRATS to you all!! Have a wonderful Mother’s Day!! Tell Jason and Hope we said Hi!! Jason - Amanda, have you decided on a name yet? I have always been drawn to Jona, Tray or Austin. Congrats on the baby boy!!! Baby boys are GREAT!! Well a boys name that I like is Jayce. I picked Kaitlynn’s name from this website http://www.babynamesworld.com if that helps you any. K. Simari - UUGGHH! I hate suspense! Its a boy, right? I think it is. Efrain Lugo - Its another girl! If it is call her Joy! That would be a nice name. soujohn - so unfair. so very unfair. C’mon we all want some excitement. Well, whatever the gender of the baby it still has one of thee coolest last names ever. Kenny Roy - It’s totally a penguin! Lisa - Yeah I agree with everyone else… I think that you should tell us what the baby is going to be. Also, good luck on the interview. Lora - It’s a boy, isn’t it? My friends have all had boys this year and my sister just had another boy this past Sunday! So I’m going with boy!! Kurt J - I’m going with Kenny’s guess and saying its a penguin. Barbara Peterson - I’m guessing it’s a boy. And I suggest naming him Don’t. But you’ll have to add a hyphenated last name. So he’d be Don’t Kern-Bodycopy Sorry, couldn’t resist. Whatever it is and whatever you call it we’ll love it. Especially if it’s anything like Hope. stacey - congratulations on finding out! now tell us! kristy pennino - i say this is just pure meanness! Jessi VanPelt - Ya, humpf! I hope he or she is not a penguin…Florida’s too hot! I think Hope needs a little sister. I have a little brother, and it was not that fun… And I agree, Joy would be a nice name. Anyway, congrats! Either way, its a baby! Let us know how the Savannah eLearning is…I was considering that. Mandy Bee - I also think Kenny’s right. Tatyana Wilson - Oooo!!!! Congratulations!!!! I am so excited about the news! I know exactly how are you feeling because I had a baby 6 months ago, and it still seems like it was yesterday. I am very happy for you and your husband! I wish you all the best, hope it will be an easy and healthy pregnancy. And, Miss Kern, if you need any help, I will be happy to do my best, I know how hard it is to be pregnant and have a job! Colette Ruff - You are sooo wrong for doing this to us! Pay back is a m*ther, you know what I mean…HA HA! LATE NITE/MORNING Feedings. DIAPER PALES STICKING UP THE HOUSE! I still love you though. God Bless and quick delivery! Whatever it is I know you’ll both be the best parents you can be. Just look at Hope!